The secret’s out of the bag. Britney Spears’ lover Sam Asghari almost broke the internet after showing off a huge bulge in his shorts on social media. Is this why Spears can’t get enough of her new boyfriend? Asghari shared a photo of his tight six pack and toned body on social media this week — but that’s not what caught everyone’s attention. Fans were quick to notice his massive package, which definitely ranks up there with the largest we’ve seen. But is Asghari really packing something that large? Or was the photo faked? While the photo looks legitimate, it was most likely Photoshopped. Turns out the original image doesn’t feature the same bulge, which has clearly been doctored up. It does, however, include a fairly impressive bulge that basically still managed to set Twitter on fire. In fact, a few fans commented on the pic and asked if Spears could share the love. “Damn Britney, can I come to the slumber party too?” one fan wrote. Faked photo or not, Britney Spears’ romance with Asghari is clearly heating up. Although the singer has struggled in the relationship department over the years, inside sources claim that she and Asghari exchanged vows in a secret ceremony. Although the wedding rumors have not been confirmed, it is clear that Spears and Asghari are getting along just fine. In fact, Spears recently shared a Snapchat video of her and Asghari dancing to Willy William and J. Balvin’s new song, “Mi Gente.” The two couldn’t help but laugh at each other in the clip and appear happier than ever. 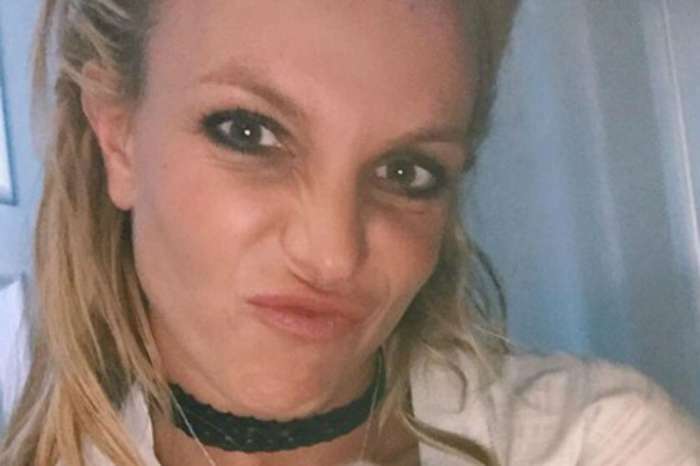 In addition to spending time with her boyfriend, Spears has been working hard on her Piece of Me tour in Las Vegas. Asghari, a personal fitness trainer, has been helping her stay in top shape while her show schedule reaches its end. Spears and Asghari have not commented about the wedding rumors or their future together. Based on his recent photo, it’s easy to see why Britney Spears is keeping him around. Whether or not this leads to something more serious is yet to be seen.